It's once again been awhile since I've reported back on my Reading Challenge Redux for this year. If you need a refresher, I've committed to reading 12 books in 2013 by authors of whom I've previously only read a single book. With May rapidly coming to a close, my showing is pretty poor: I've only blogged about one of the books on my list. 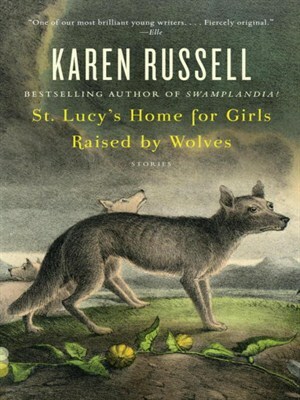 Here's an attempt to make up for that with a peek at St. Lucy's Home for Girls Raised by Wolves (M), the début short story collection by American author Karen Russell. I'm pretty sure I've gone on at length on The Reader about how delightful I find Russell and about how much I enjoyed her 2011 novel Swamplandia! (M) I've been eager to read more from her for awhile. If you're a fan of Swamplandia! 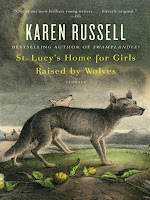 you'll want to pick up St. Lucy's Home for Girls Raised by Wolves if only to read the collection opener "Ava Wrestles the Alligator". Ava is Ava Bigtree: the protagonist of Swamplandia! and the novel evidently grew out of this story. Swamplandia! fans will not only recognize the characters, but they will also feel right at home amidst Russell's vivid descriptions of the Florida wetlands other natural landscapes. Like in Swamplandia! the stories are peopled with quirky characters, fantastical developments and natural settings that are memorable and vibrant. Russell has many literary talents and these stories highlight them. In "The Star-Gazer's Log of Summer-Time Crime" she displays her gift for telling stories through the eyes of children. Ollie (a nerdish, good-kid) enters into a summer friendship with the cool-kid/bully from his grade school: Russell gives a pitch perfect depiction of the delicate and unlikely friendships that develop in the brief out-of-school period known as summer vacation. In "from Children's Reminiscences of the Westward Migration" she shows her knack for making the mythical seem ordinary as she weaves the tale of a family struggling across America in a wagon train. A story that feels like a classic American western historical in all respects but the fact that the father of the family happens to be the Minotaur. Personally, I struggle with reading full short fiction collections: I'm more of a reader who likes to pick and choose a few tales from a full book and often feel like I have to push myself to read a collection cover to cover. This book was no different and there were some stories that didn't work well for me: on another occasion I might enjoy them, but in attempting to read the book start to finish, I just wasn't in the mood for all of these tales. On the whole though, I agree with this jacket quote from Carlo Wolff of The Denver Post : "A master of tone and texture and an authority on the bizarre, Karen Russell writes with great flair and fearlessness." There is a quality to her writing that takes you back to childhood imaginings and yet many of the stories have very grown-up messages. 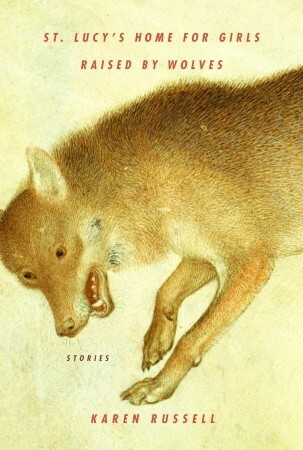 My favourite in the collection is title story, in which a group of girls are left by their wolf parents at a boarding school that aims to reintroduce them to human society. The last story in the book, it makes commentary on feminism, colonialism, family ties and what it means to to be an individual while being funny and filled with delight. If you only read one in this collection, I'd suggest this one. Although only just past 30, Russell's writing has already garnered a number of accolades that any writer would be pleased to accumulate over a life time of writing. She has appeared on lists of young authors to watch, was long-listed for the Orange Prize and named a finalist for the Pulitzer Prize. She is among a number of writers who are currently credited with revitalizing the short story form and has just released a new book of short stories called Vampires in the Lemon Grove. Chris Adrian (M):another novelist who mixes fantastical elements into his stories. Try The Great Night: a modern retelling of Shakespeare's A Midsummer Night's Dream. Jim Shepherd (M) another American author known for his short story prowess. Like Russell, Shepherd has a wry sense of humour.